$40 in advance, $50 at the door. 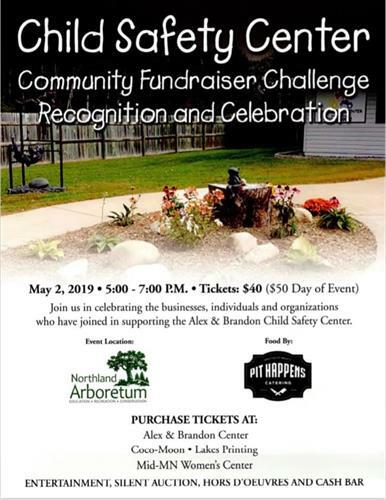 Please join us for our annual Community Fundraiser to support the Alex and Brandon Child Safety Center. This year, we will be enjoying the beautiful grounds at the Northland Arboretum in Brainerd, MN. There will be a silent auction, mouth watering food and BBQ by Pit Happens Catering, a cash bar, and live music by local favorite Seth Doud! The silent auction will take place on 32auctions.com and be open for bidding 45 days prior to the event. More details will be shared when it gets closer. Tickets are $40 if pre-purchased or $50 on the day of the event. They may be purchased at the Alex and Brandon Child Safety Center, Coco-Moon, Lakes Printing, or Mid-MN Women’s Center. Contact us at the Alex and Brandon Child Safety Center with any questions. Hope to see you there!